I spent most of the weekend in my craft room and it felt great. I don't know why I got it in my head that I couldn't start any projects because we are moving, but I did, and it was silly. So finally I shrugged off that line of thinking and got back upstairs to my craft room. The warmer weather made me feel like making skirts, so I did. 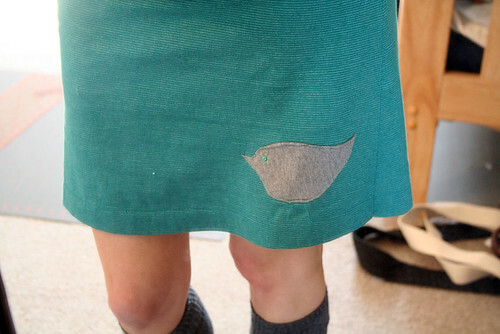 I made yet another "t-skirt" and added a little birdy appliqué to it. Spring! Yea! Making things feels great.